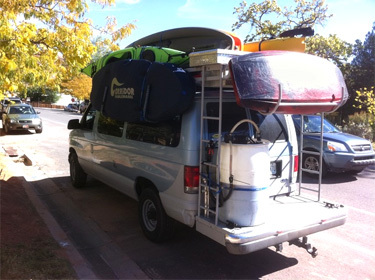 I am back from MY vacation (backpacking in Utah), and I’m back just in time to see the van loaded to the gills for Cully’s annual drive south. 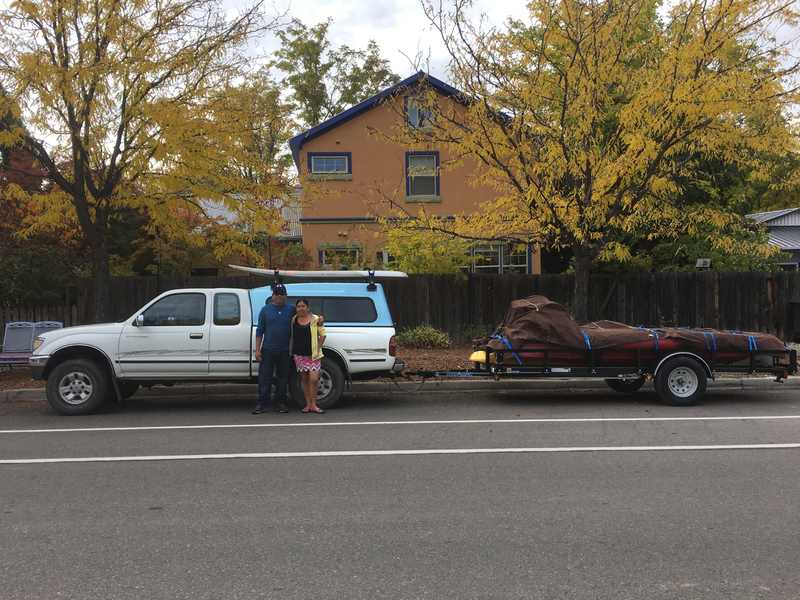 He’s not taking a trailer this year, just a new van, so the load is particularly creatively packed. Cully drives to Belize every year. 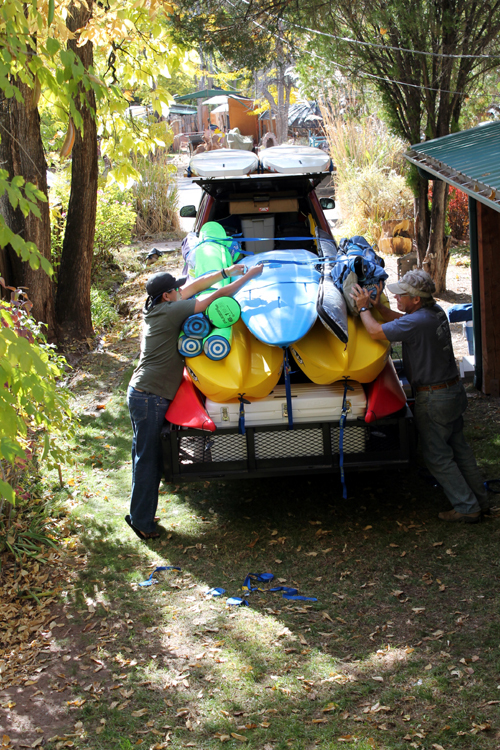 That is the only way to get all of our kayaks, boards, generators, etc. down to Belize and out to the island. 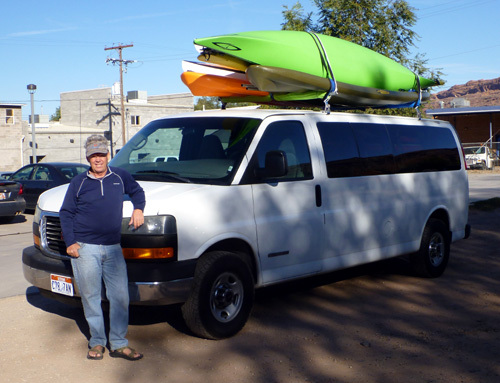 Victor Myers, one of our Belize trip managers, showed up from Boise last week with most of the boats and boards Cully will be driving down. Victor attended the Outdoor Retailer trade show for us in July and bought a lot of new equipment for us there, and this was the delivery of the new loot! New gear clockwise from upper left: two Versa Boards, one new Current Design sea kayak, cruiser paddleboard, two race-style cruiser board, another Current Design sea kayak, expert-level paddleboard. So it was basically a van swap. 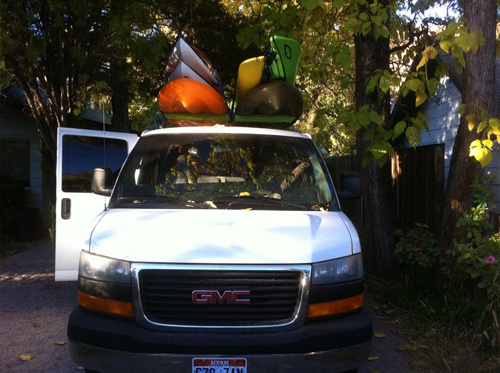 Victor pulled up to my house in Moab, unloaded everything, and then they loaded it all onto our new Belize Adventure Week van. 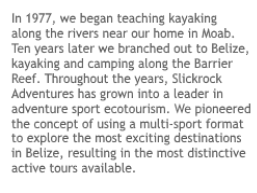 Every year we have other lodges in Belize wanting to buy our used equipment. Fat chance! 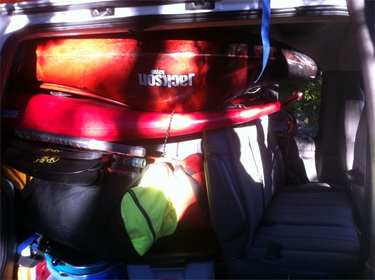 We take very good care of our gear and use it for years. Some of our favorite sea kayaks go back to the old days on Northeast Caye, or even before when we used to kayak island-to-island out of Placencia, Belize. This is why we have the best sport gear in the country of Belize. Each piece is hand-picked by Cully, driven down, and repaired onsite with parts we also drive down. 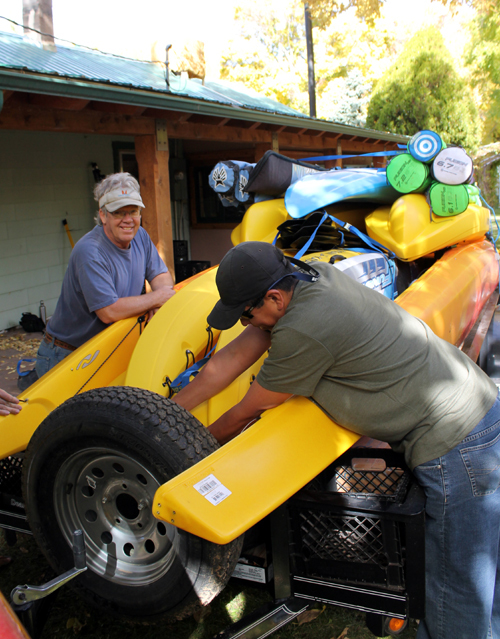 Every single life jacket, paddle, rudder cable, and surfboard fin is hand-carried by us to Belize. Cully leaves on Monday! 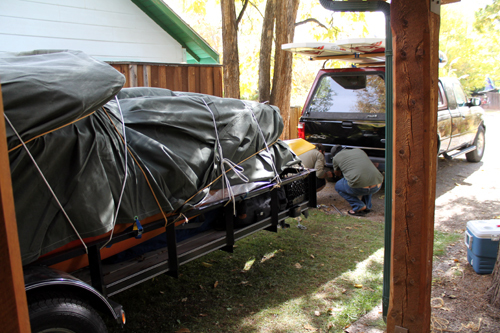 I’ll be posted more photos of the big departure. And just what did he fit inside? 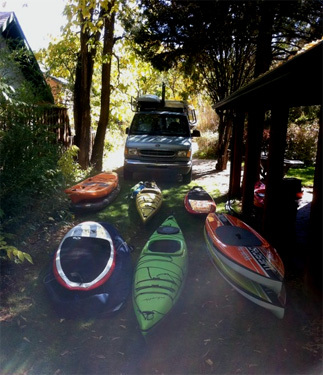 A whitewater kayak for rolling lessons, another surf kayak, paddles, lifejackets, solar equipment, a new generator, more sails, booms and mast, kitchen utensils, office equipment, and lots of tools!